CGA Engineers was selected as the civil consultant by ONE Architecture, LLC to design and prepare plans for a Health and Wellness Center for he Seminole Nation of Oklahoma. The 13.6 acre site is located north of Highway 59 approximately 3.2 miles southwest of Seminole, Oklahoma. 1.8 acres of the 13.6 acre site is being developed for the Health and Wellness Center. The tasks included site survey, grading, drainage, utilities, surfacing, erosion control, and stormwater management. Utilities included extending water, sanitary sewer, electrical, gas, and telecommunication lines into and adjacent to the property. The site was designed to give consideration to future expansion of the building and site. The drainage around the building was designed as open channel flow. When the proposed gymnasium is added the stormwater will be easily converted to a closed system. The site-grading plans are detailed and provide coordinate and elevation information for all points necessary for a surveyor to lay out the construction staking. 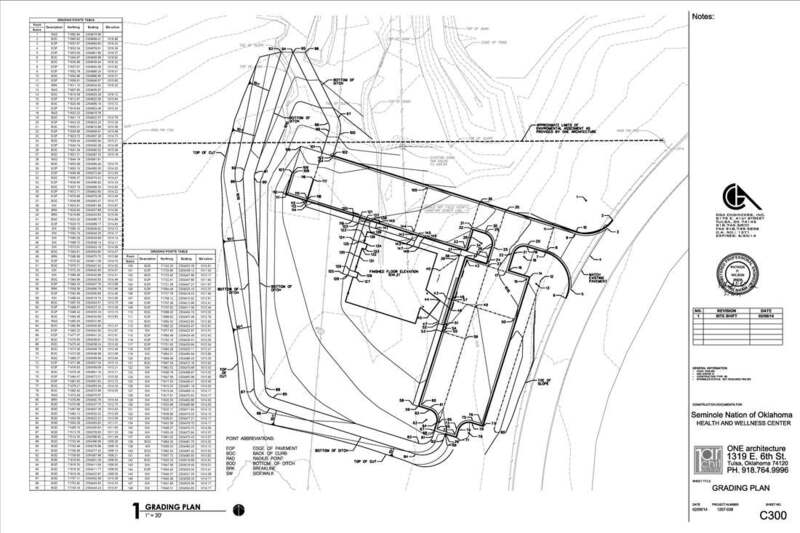 The contractor is not required to develop information from assumptions or lay out the grading contours. The layout information is explicit.